Bolted Shelving – Canadian Rack Inc.
Canadian Rack is a VAR for Metalware Slotted Angle Bolted Shelving. Slotted angle bolted shelving is the most economical solution for your storage needs. 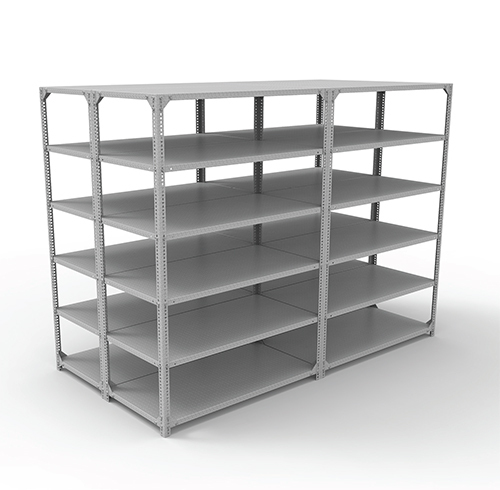 Available with braces, gussets or panels, our shelving is very easy to assemble, sturdy and long-lasting. A wide range of dimensions is available. Our two different types of posts can be used in a variety of situations. They can be cut and bolted into work bench, shelves, tables etc. Also, they can be used as top tie with our Wide Span Shelving and Interlock Boltless product lines. Units can be bolted into side by side and back to back rows. Canadian Rack shelving experts will help you maximize your storage space in the most economical manner. Layouts and quotations are provided free of charge.